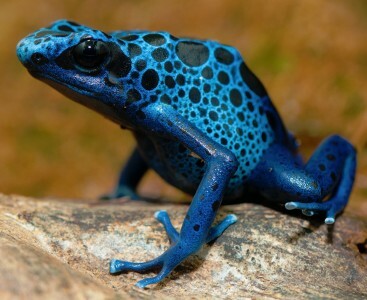 A blue poison dart frog (Dendrobates azureus) is featured in this online jigsaw puzzle. The frog is a native of South America. The poison dart frog’s skin excretes a toxin that can be lethal, and has been used by South American Indians to poison the tips of their blow darts. Credit: Special thanks to Alex Bartok for making the photograph used for this jigsaw puzzle available through the Creative Commons Attribution ShareALike license. Visit Alex Bartok's Flickr photostream. See all jigsaw puzzles based on Alex Bartok's photographs.